Just Romantic Suspense: My Suspense Novels are Going to Hollywood…Am I Ready? My Suspense Novels are Going to Hollywood…Am I Ready? I can’t help myself. I’m answering the call. Based on your experience, how nutty am I? It played out this way. I write suspense/mystery/romance novels so I branched out last year (I’m a longtime RWA member), by joining Sisters in Crime. I went to a mystery/crime/thriller conference in Long Beach last year and enjoyed it; attended the Left Coast Crime conference in Scottsdale this year and loved it. So I signed up for a free three-day event, sponsored by Hollywood and Sisters in Crime. Did you catch the word “FREE?” Yup. Breakfasts, lunches and sessions are gratis; I’m only paying for the three nights in Hilton Universal Studios and I’m taking the train (three hours) from my home in the Central Coast. I can’t go wrong. Can I? 1. What do my contracts say about my movie and TV rights? 4. What would a producer pay for my novel or my series? No answers here, so far, but I’m working on it. 5. How do I dress; how aggressive should I be? It’s a free event, so what does Hollywood expect in exchange for free? Gulp! 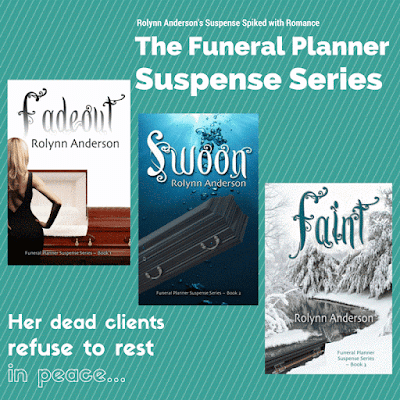 The Funeral Planner Suspense Series (FADEOUT, SWOON and FAINT): We’re in small-town California where a boutique funeral planner, her much-raking journalist lover, a blind forensic investigator, their tribe of friends, and a service dog, expose the secrets of the dead. Twist: She has a fainting disorder with prescient faint-dreams about her clients. The Scottie pup, Elly, predicts her faints-spells. Sounds like it's going to be a pretty cool experience. Good luck! Thanks, Natalie. I almost feel like wearing a billboard with my log-lines all over it. Or maybe a costume? Some big smoke actors, agents and producers will be there...how do I stand out? I'd be too nervous to get a word out. But I'm betting you'll do fine. Dazzle them, hon. After all, you're a Muse...and few people can claim that. Thanks, Vonnie. I wish I had an agent like you do, because it would be nice to have someone advising me when I talk to these producers. Still, your support means a lot to me. Thanks! Definitely report back. I'm sure you'll do great! Thanks Margo. Glad to have you cheerleading on the side! Rolynn, can't wait to hear how it goes. I have a book I would love to see as a movie but I'm clueless about that end of the business so will be following your journey closely. I'll report back, Jill. I shouldn't get my hopes up, but it's important I take the opportunity seriously and feel positive about the outcome. I've got my 'one sheets' ready...and I'm even thinking about touting the book I'm writing right now, even if it's only half done. See how I get revved up? I'm nuts! Alison Sweeney, star of Murder She Baked based on the mystery series by Sisters in Crime member Joanne Fluke, will appear on Sunday morning to discuss what she looks for as an actor, producer, director. On Saturday afternoon one of our panelists is Cameron Larson, Hallmark Movies and Mysteries Channel. See what else is cooking at Hallmark, home of cozy mystery series. Another panelist is Carol Baum who has a long track record in feature film production: Father of the Bride (1991), Dead Ringers (1988) and The Good Girl (2002) to name just a few. Go, Rolynn! Good luck. You'll do awesome! Hart Hanson created the successful and long-running television series Bones, based on books written by best-selling crime author Kathy Reichs. Michele Mulroney co-wrote the second movie in the incredibly popular Sherlock Holmes movie franchise starring Robert Downey Jr and Jude Law titled Sherlock Holmes: A Game of Shadows (2011). She is known for Paper Man (2009) and Sunny & Share Love You (2007). Drew Greenberg is a former lawyer, now producer and writer on Agents of S.H.I.E.L.D. He's written for several series that have been adapted from Marvel Comics. He's also had a very distinctive television writing career, that includes Buffy the Vampire Slayer, Arrow (2012), and Warehouse 13 (2009). We will have a Q & A with two show biz vets. Agent Ron Mardigian of William Morris Agency and former studio VP Marianne Moloney have agreed to be mentors. They will talk about how to target the "right" production entity with your book, give advice, and answer your questions. Marianne Moloney began her professional career in New York book publishing at Viking/Penguin as an acquisitions editor, then worked as a literary agent in LA representing writers and directors in film and tv. She's been VP for Production at Universal, President of Motion Pictures at MTM Enterprises, and has worked as an independent producer for films with Warner Bros./Samuel Goldwyn Company, Paramount Pictures and the Showtime Network. She is currently at work on producing two drama series ORIGINS and TWO SPIRIT together with her film projects in development. Ron Mardigian spent several years as a literary agent in the television and motion picture literary departments at the William Morris agency, where he rose to the position of Senior Vice President and Head of the William Morris Motion Picture Literary Department, West Coast. Ron represented a great number of well-known film and television clients and was involved in structuring and packaging many major motion pictures projects throughout his career. In addition to his agent duties, as a mentor and teacher, Ron also took on and was responsible for training new agents. Some of his protégés from William Morris have become not only very successful agents, but also prominent participants in various aspects of the entertainment world and today enjoy positions of great responsibility in the creative and executive areas. Keeping my fingers crossed, Rolynn, for success! How exciting! Best of luck. I can't wait to see your name in lights! !